Vicka speaks again after a long absence. 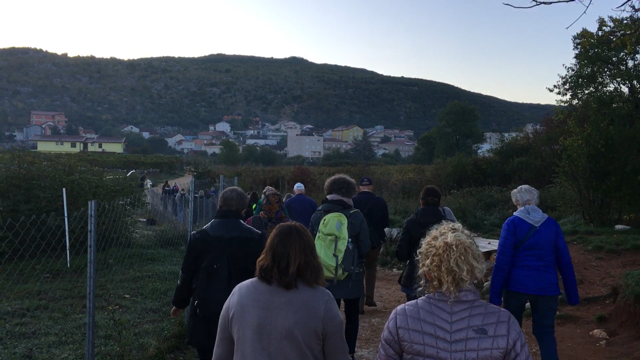 Today our group rose early in the morning and walked together, praying the Rosary, towards Apparition Hill. 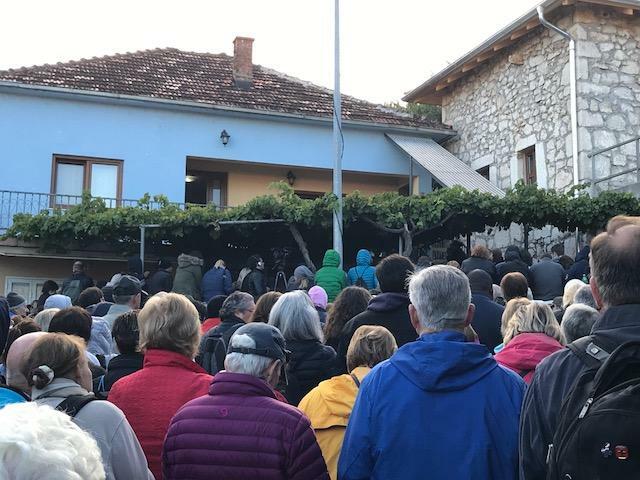 Our destination was Vicka’s family’s ancestral home, where Vicka has resumed giving her witness to pilgrims on Monday, Wednesday and Friday mornings. It is such a familiar spot, on the narrow road in Bijakovici, just before the entrance to the Apparition Hill climb. When the pilgrims gather to hear Vicka, all traffic is stopped! No one can get through! 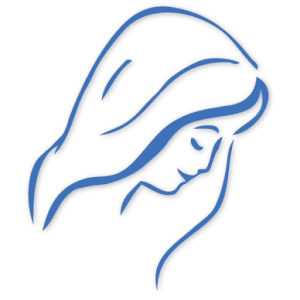 I am happy to share with you Our Lady’s main messages. The main messages of Our Lady are prayer, peace, conversion, confession, and fasting. And Our Lady recommends that we pray all three parts of the Rosary daily. And she recommends fasting every Wednesday and Friday on bread and water. And a beautiful thing that Our Lady invites us to pray for is to pray for our strong faith. But when Our Lady invites us to pray, she doesn’t want us to just move our lips. But Our Lady would like for us day by day to open our hearts so that prayer may really become a joy for us so that we may succeed to pray with love. We stood in silent prayer for more than 1/2 hour, drinking in the peace. This is only a sample of what Vicka said, but you can hear the entire talk on our website soon. Vicka prayed then in silence for a very long time. One pilgrim told me that she felt drawn into prayer, as into a deep pool of water. She was able to pray unusually well as Vicka prayed. Vicka is a luminous example of someone who is given over completely to God. She suffers joyfully, offering all her suffering to the Lord. And she witnesses such joy! PS. 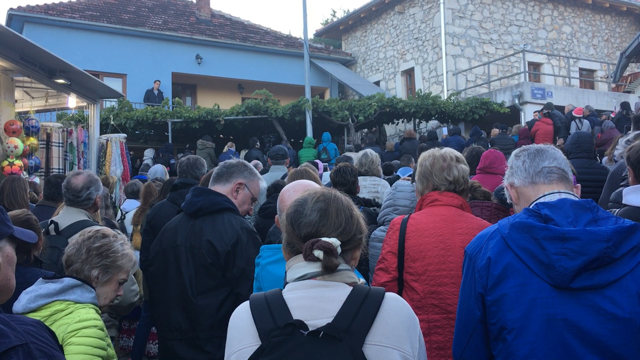 One of our pilgrims stayed behind to listen to Vicka again and again, almost all morning. When Vicka was leaving, she had one of her helpers give him a rosary she was praying with. it was so special to receive that rosary. But he noticed a woman near the stair that Vicka had been standing on, begging that Vicka come back to just pray with her a little. She was desperate. But Vicka was exhausted and they couldn’t ask her to return. The woman was so sad. So our pilgrim placed the rosary Vicka had given him into her hands and explained that it was Vicka’s rosary. He said she could have it. She broke down in tears. He found out she was very ill, and this rosary meant the very much to her. She wept and wept. We have no idea what wonders God is working in us as pilgrims as we love one another. In heaven we will know!!! https://marytv.tv/wp-content/uploads/2016/12/MaryTV-Logo.jpg 700 700 Cathy Nolan https://marytv.tv/wp-content/uploads/2016/07/weblogo_sm_1.0.png Cathy Nolan2017-10-10 13:26:052017-10-10 13:26:51Vicka speaks again after a long absence.